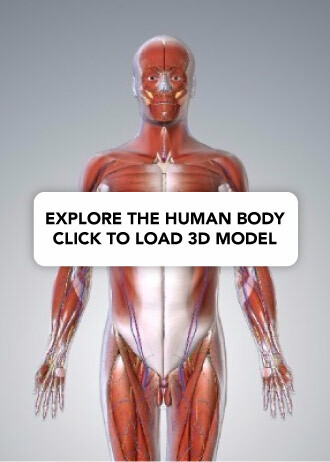 BodyParts3D, © The Database Center for Life Science. Fig 1.0 – Overview of the location of the cervical spine. The cervical spine is the most superior portion of the vertebral column, lying between the cranium and the thoracic vertebrae. The first cervical vertebrae (C1) is known as the atlas. The second cervical vertebrae (C2) is known as the axis. In this article, we shall look at the anatomy of the cervical vertebrae – their characteristic features, articulations and clinical relevance. Bifid spinous process – this is where the spinous process splits into two distally. Transverse foramina – holes in the transverse processes. They give passage to the vertebral artery, vein and sympathetic nerves. The atlas and axis have additional features that mark them apart from the other cervical vertebrae. The atlas is the first cervical vertebra and articulates with the occiput of the head and the axis (C2). It differs from the other cervical vertebrae in that it has no vertebral body and no spinous process. Instead, the atlas has lateral masses which are connected by an anterior and posterior arch. Each lateral mass contains a superior articular facet (for articulation with occipital condyles), and an inferior articular facet (for articulation with C2). The anterior arch contains a facet for articulation with the dens of the axis. This is secured by the transverse ligament of the atlas – which attaches to the lateral masses. The posterior arch has a groove for the vertebral artery and C1 spinal nerve. The axis (C2) is easily identifiable due to its dens (odontoid process) which extends superiorly from the anterior portion of the vertebra. The dens articulates with the anterior arch of the atlas, in doing so creating the medial atlanto-axial joint. This allows for rotation of the head independently of the torso. The axis also contains superior articular facets, which articulate with the inferior articular facets of the atlas to form the two lateral atlanto-axial joints. Fig 2 – The bony landmarks of the atlas and axis. The joints of the cervical spine can be divided into two groups – those that are present throughout the vertebral column, and those unique to the cervical spine. There are two joints unique to the cervical spine – the atlanto-axial (x3) and atlanto-occipital joints (x2). Lateral atlanto-axial joints (x2) – formed by the articulation between the inferior facets of the lateral masses of C1 and the superior facets of C2. These are plane type synovial joints. Medial atlanto-axial joint – formed by the articulation of the dens of C2 with the articular facet of C1. This is a pivot type synovial joint. 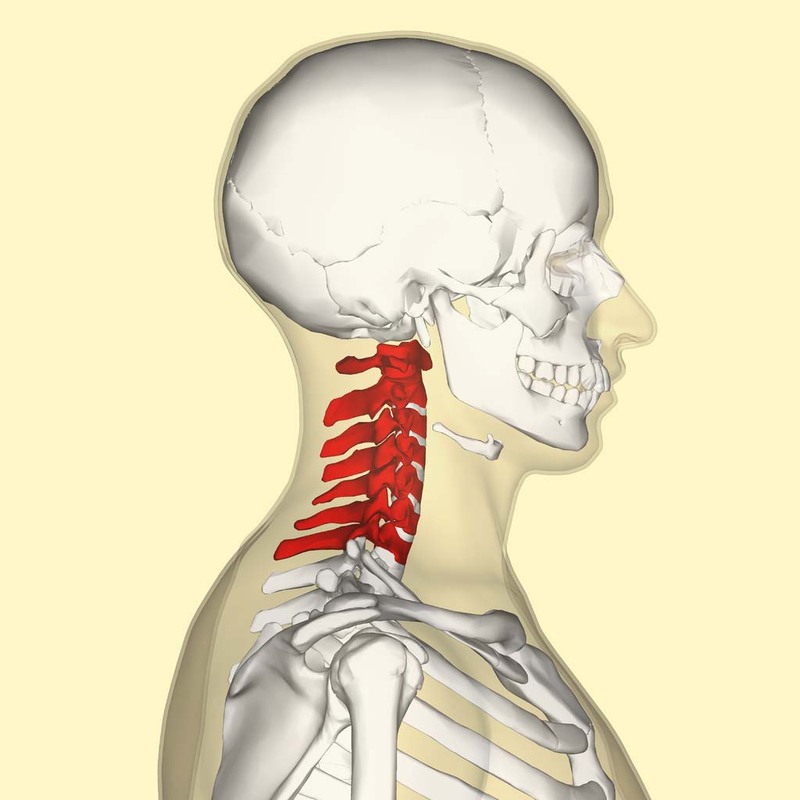 The atlanto-occipital joints consist of an articulation between the spine and the cranium. They occur between then superior facets of the lateral masses of the atlas and the occipital condyles at the base of the cranium. These are condyloid type synovial joints, and permit flexion at the head i.e. nodding. There are six major ligaments to consider in the cervical spine. The majority of these ligaments are present throughout the entire vertebral column. Anterior and posterior longitudinal ligaments – long ligaments that run the length of the vertebral column, covering the vertebral bodies and intervertebral discs. Ligamentum flavum – connects the laminae of adjacent vertebrae. Interspinous ligament – connects the spinous processes of adjacent vertebrae. Nuchal ligament – a continuation of the supraspinous ligament. It attaches to the tips of the spinous processes from C1-C7, and provides the proximal attachment for the rhomboids and trapezius. 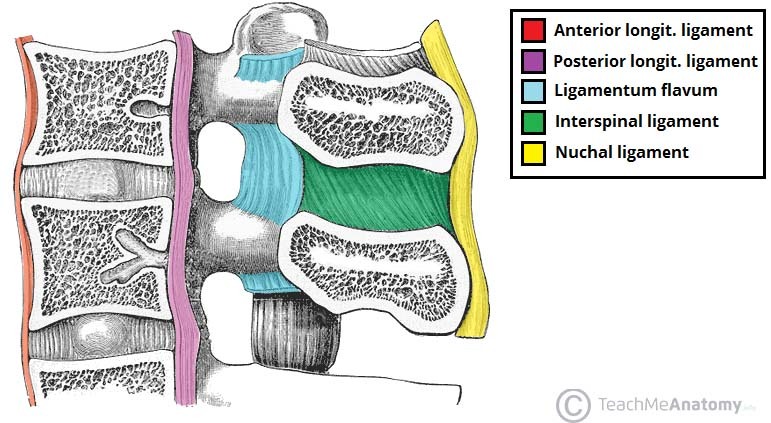 Transverse ligament of the atlas – connects the lateral masses of the atlas, and in doing so anchors the dens in place. (Note: Some texts consider the interspinous ligament to be part of the nuchal ligament). Fig 3 – Ligaments of the cervical spine. The cervical spine has a close relationship with several neurovascular structures in the neck. The transverse foramina of the cervical vertebrae provide a passageway by which the vertebral artery, vein and sympathetic nerves can pass. The only exception to this is C7 – where the vertebral artery passes around the vertebra, instead of through the transverse foramen. The spinal nerves are intimately related to the cervical vertebrae. They extend from above their respective vertebrae, through the intervertebral foramen created by the joints at the articular processes. Again, C7 is an exception – it has a set of spinal nerves extending from above (C7) and below (C8) the vertebra. Therefore, there are eight spinal nerves associated with seven cervical vertebrae. 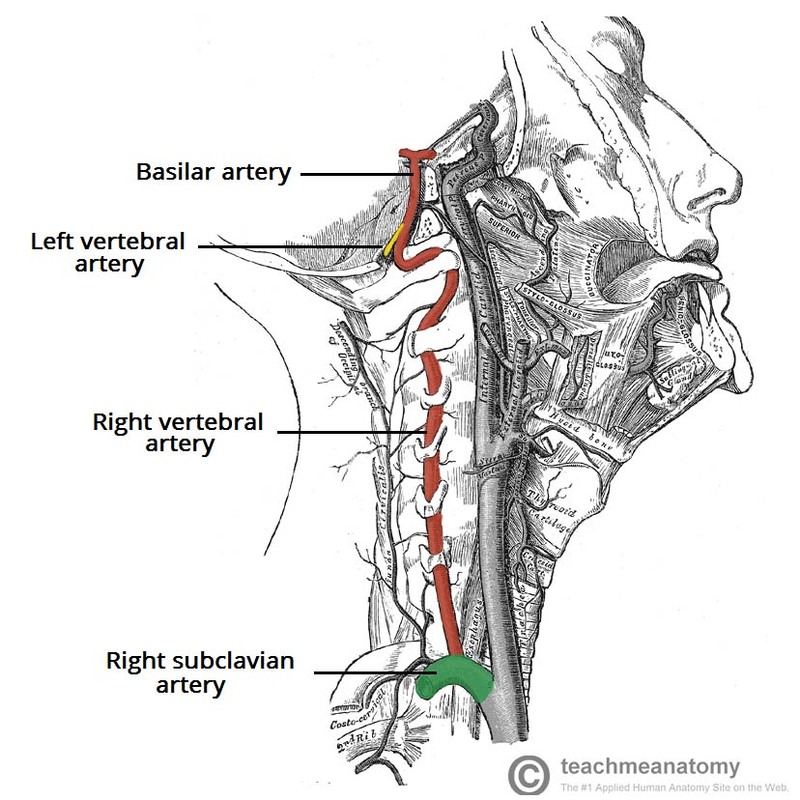 Fig 4 – The right vertebral artery. Note its course through the transverse foramina of the cervical vertebrae. A vertical fall onto an extended neck e.g. diving into excessively shallow water can compress the lateral masses of the atlas between the occipital condyles and the axis. This causes them to be driven apart, fracturing one or both anterior/posterior arches. If the fall occurs with enough force, the transverse ligament of the atlas may also be ruptured. Since the vertebral foramen is large, it is unlikely that there will be damage to the spinal cord at the C1 level. However, there may be damage further down the vertebral column. A rear-end traffic collision or a poorly performed rugby tackle can both result in the head being whipped back on the shoulders, causing whiplash. In minor cases, the anterior longitudinal ligament of the spine is damaged which is acutely painful for the patient. 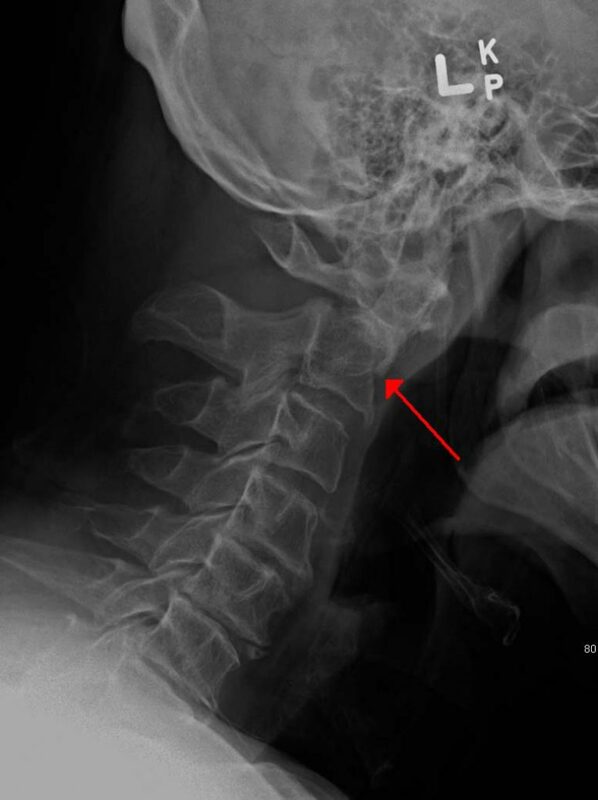 In more severe cases, fractures can occur to any of the cervical vertebrae as they are suddenly compressed by rapid deceleration. Again, since the vertebral foramen is large there is less chance of spinal cord involvement. The worst-case scenario for these injuries is that dislocation or subluxation of the cervical vertebrae occurs. This often happens at the C2 level, where the body of C2 moves anteriorly with respect to C3. Such an injury may well lead to spinal cord involvement, and as a consequence quadriplegia or death may occur. More commonly, subluxation occurs at the C6/C7 level (50% of cases). The hangman’s fracture is the name given to a fracture of the pars interarticularis, which is a bony column between the superior and inferior articular facets of the axis. Its name originates from the mechanism by which it is most commonly created, as a result of the sudden deceleration that occurs in hanging. 5 – A fracture of the base of the dens. Such an injury is likely to be lethal, as either the fracture fragments or the force involved are likely to rupture the spinal cord, causing deep unconsciousness, respiratory and cardiac failure, and death. Fractures of the dens make up around 40% of the fractures of the axis, and are most commonly caused by traffic collisions and falls. Often these fractures are unstable and are at high risk of avascular necrosis, due to the isolation of the distal fragment from any blood supply. As a result, fractures of the dens often take a long time to heal. As with any fracture of the vertebral column, there is a risk of spinal cord involvement. Which of the following vertebrae is otherwise known as the atlas? Which structure does the odontoid process of C2 articulate with? At which joint does flexion of the head occur?